Hostel Club V&S is in a beautiful remade French-style house built in the 19th century offering both an antique and a modern style altogether. *In front of Suipacha Square. *Only 500 meters from the Coln Theater, the Obelisco, pedestrian and commercial streets Florida and Lavalle, and Corrientes Avenue which boasts the most selective theaters. *Only 10 minutes away from: the domestic airport Jorge Newbery, the Retiro Bus and Train Station, the Fluvial Station and the charming Puerto Madero. Hostel Club V&S has all the facilities you need. We offer in all of our rooms a unique style and decoration. Each room has a ceiling fan, heating and/or air conditioning. All of our bathrooms are private so that you can have more Privacy. Hostel Club V&S offers a warm and bright common room; equipped with a wide screen cable television and a video library, so that you can enjoy the latest movies as if you were right at the cinema. Hostel Club V&S organizes different events for our guests: Tango classes at the hostel, excursions around the city such as football matches, bike tours and porteos night life. Fully fitted and equipped kitchen including microwave oven and fridge/freezer where you can prepare your favorite food. Internet room consisting of several computers equipped with flat screen computer monitors, webcams, earphone headset and microphones (for Skype and MSN). Wi-Fi. Our kind and helpful staff is always willing to offer you the best advice to make your stay more comfortable and unforgettable. * Buffet type breakfast: coffee, tea, mate cocido, milk, croissants, homemade cakes, toasts, marmalades, cream cheese and cereals. * Luggage storage / Lockers. In case of early arrival, Hostel Club V&S offers you our luggage storage for you to leave your bag, while you have breakfast, visit Buenos Aires, or simply stay in one of our common areas of our hostel. Once you have left your room, you can leave your bag in our luggage storage and stay in one of our common areas of our hostel, or go out for a stroll around the city and pick them up during the day. 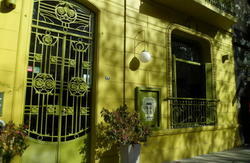 We look forward for you visiting us and willing you enjoy your stay in Buenos Aires!!!! *200m from Florida and lavalle, pedestrial street.